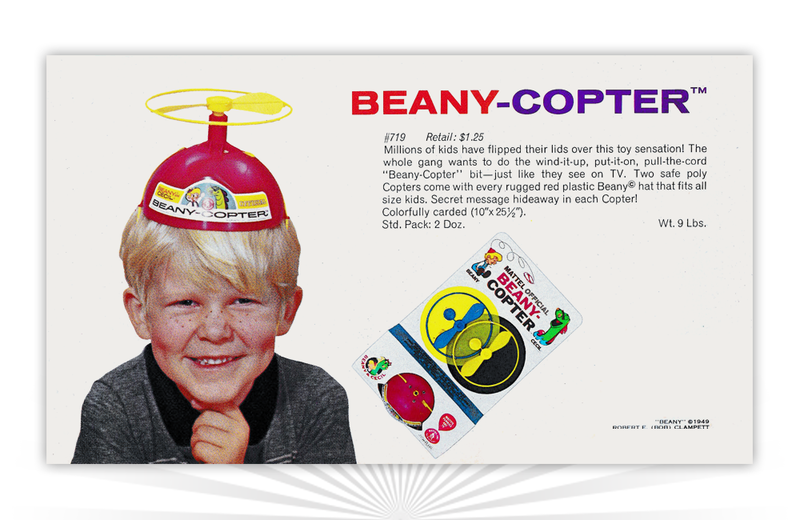 A 1963 dealer advertisement for the Beany-Copter from Mattel. The propeller beanie cap was inspired by the Beany and Cecil Show, an animated cartoon series that ran for eight seasons on ABC. The show focused on the adventures of young boy named Beany and his friend Cecil, a large green sea serpent. In the show, the Beany-Copter allowed Beany to fly. In real life, Mattel’s toy version didn’t allow the user to take flight, but was still pretty nifty. It included a bright red plastic beanie, 5 ½-inches in diameter, and a set of yellow and blue plastic ‘copter propellers. A large sticker on the front of the cap featured Beany, Cecil, and their logo. The copters could be attached to the beanie’s integrated “copter launcher”, and kids could launch these by pulling down on a yellow cord. The pièce de résistance? Each ‘copter had a small space to hide a secret message!